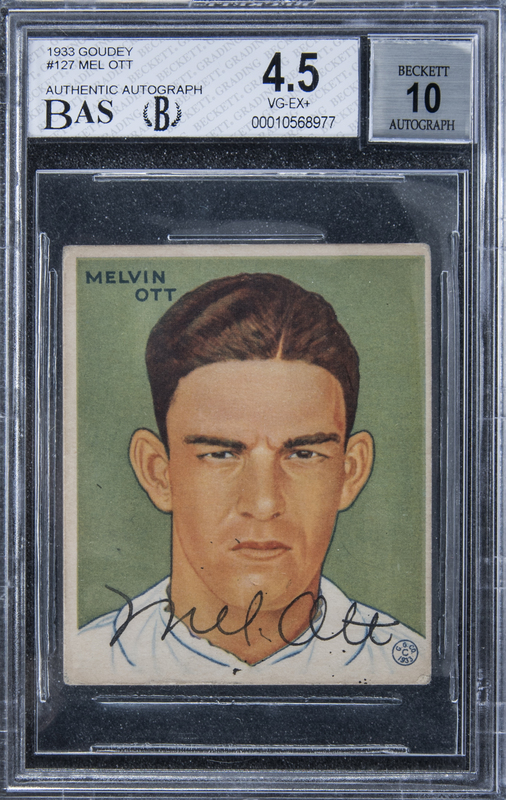 Lot Detail - 1933 Goudey #127 Mel Ott Signed Card – Beckett "10" Signature – The Highest-Graded & Only Known "10" Mel Ott Signed Card! 1933 Goudey #127 Mel Ott Signed Card – Beckett "10" Signature – The Highest-Graded & Only Known "10" Mel Ott Signed Card! Encapsulated and graded VG-EX+ 4.5 by BAS, with Autograph Grade "10" by BGS. Hall of Famer. Presented here is an exceptionally appealing gum card that features the bold and precise, fountain pen signature of its subject on its front. This sublimely colored '33 Goudey depiction delivers all of the pure and uncluttered, artistic allure for which its release is so widely cherished. The slugger's likeness beams brightly from the card's obverse, and the green-inked back is clean and fully legible. Worthy of special note is that this card possess the highest numerical grade for physical condition ever awarded bearing a Mel Ott signature and the only known signature "10" for such a card. The offered item exhibits very pleasing display quality, and, again, its sought-after autograph projects marvelously. A unique and extremely desirable signed collectible! Ott, a 1951 Cooperstown inductee, passed away in 1958. One of the hobby's most-significant Ott cards! 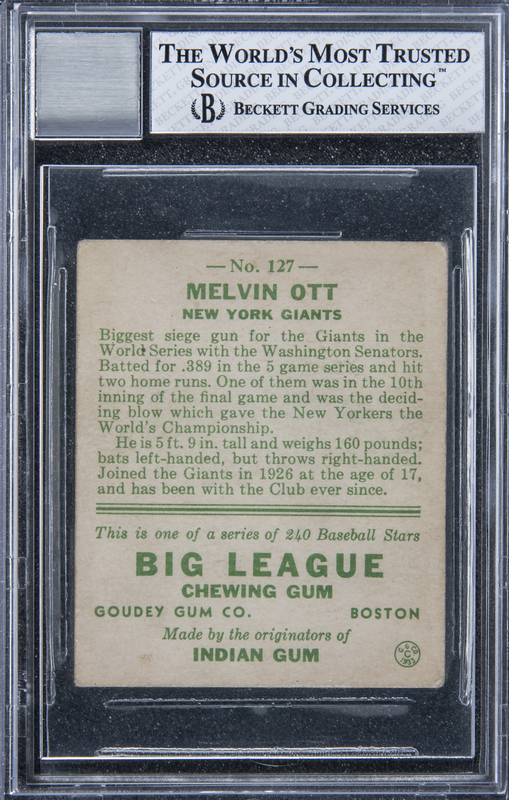 Please Note: Although this card’s label reflects “9” in the printed catalog as its autograph grade, the piece is recorded in the BGS database as holding a “10” assessment and was re-holdered by BGS following the printing of the catalog. The correct image is currently displayed on the website.